I was already familiar with Al Mina when they used to be located in Central Market Arcade in the city. A month after opening the store in Prospect, the city location closed, as did the retail component of their store in Blair Athol. For Sam, one of the co-owners, it was all about consolidation and choosing a more popular location. Unlike the former Al Mina Central, the menu is more extensive with zoccacia, manaeesh, wraps, pizzas and salads. They also have a delicious range of Middle Eastern sweets on display behind the counter. These are made over at Blair Athol. To start off with, I had the Zaatar Manaeesh. Freshly baked and ready within minutes after ordering, it was nicely presented on a wooden board. 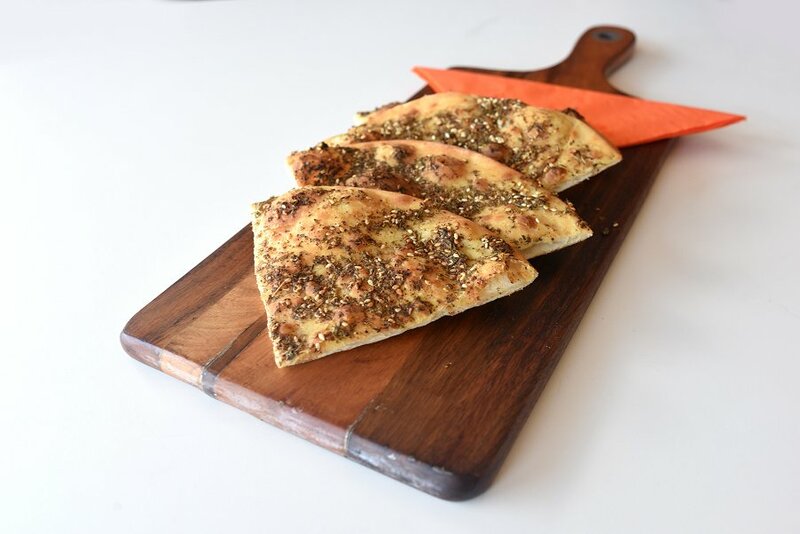 On top of a perfectly thin and crispy crust was a Middle Eastern herb mix that contained 12 spices including toasted sesame seeds, sumac, oregano, thyme and coriander. It was a great way to start off proceedings. The A.B. 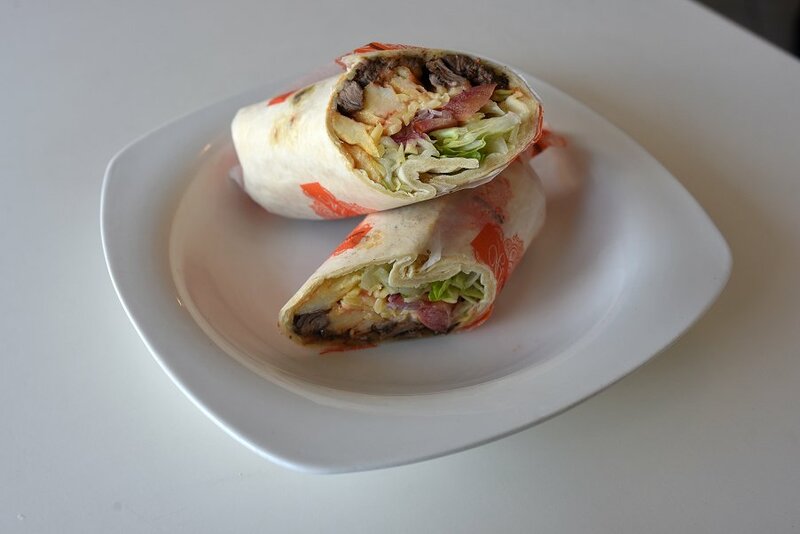 Wrap was an interesting interpretation of a late night favourite. The morsels of lamb were well seasoned and juicy, and the vegetables were fresh and crisp. The chips were crunchy on the outside with a soft pillowy centre.. The sauces were a tomato and Dijon ranch dressing; required to prevented the wrap from being too dry but a little on the mild side for my liking. 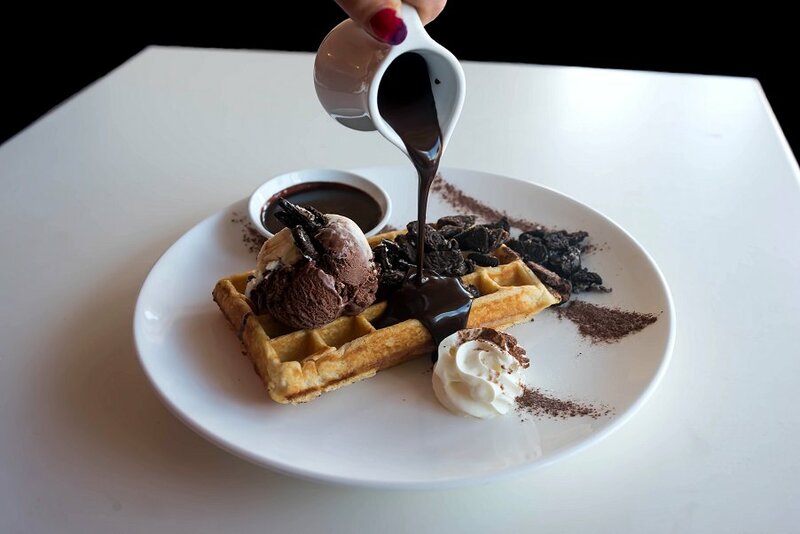 No meal is complete without dessert, so I went for their Cookies and Cream Waffle. The freshly made waffle was chewy on the outside, and fluffy in the centre. There was good contrast between hot and cold with the warm Belgian chocolate and the cold vanilla ice cream. The crushed oreos added a nice crunchy texture, and all in all, a great way to finish off the meal. Al Mina on Prospect is better than ever, with a steady flow of customers coming into their store throughout the day. They’re now open for longer hours and give the customer more choice when it comes to food. Everything is made fresh and the customer service is fantastic. Located on the Prospect Road cafe precinct, they’re definitely worth checking out. Al Mina on Prospect is open from Sunday to Thursday from 10am-10pm, and on Friday and Saturday from 10am-11pm.